This is a beautiful comforter set that is well made, soft and durable. It looks great in our son's bedroom and we've already received numerous compliments on it. Freshen up your guest bedroom with this classic comforter set. 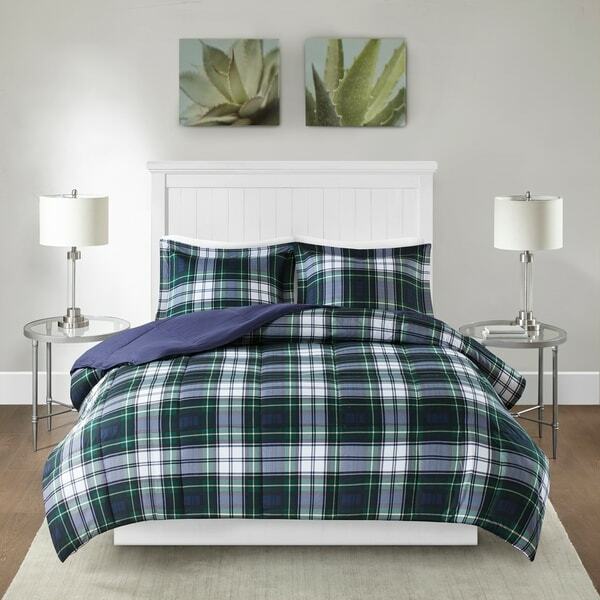 Made from polyester, the cozy comforter features a navy and green plaid design, and down-alternative fill for warmth. Matching shams complete the set for a cohesive look. This set was purchased for my second guest room. The colors pictured are true to those of the actual set.. The feel of the fabric is quite soft and comfortable. It is lightweight. Pay attention to the dimensions of the comforter to be sure you will have adequate width to cover your mattress sides. I have not washed it yet but it appears to be well made. I am happy with the purchase and consider it to be a good value. For the size this is a great buy. It fits my queen bed great. My mattress is pretty thick and my queen cover didn't cover the whole bed, it left the foundation visible. Fits great in my washing machine and dryer. The only drawback for some, might be that it isn't a heavy cover. You can't find this size of comforter in any store for the price. I bought this for my 18 years old son. He loved it, it is comfortable and light. Also, he likes the fact that when making his bed, the comforter makes a good job hiding his messy sheets. In theory he doesn't make his bed, he just threw the comforter over the sheets, and you never realized the mess he has underneath. The feel of this comforter isn't the highest quality but the look is. It's bright, well made, and the pattern is exactly that of a twin comforter I had previously for my son's room that was Ralph Lauren and 4x the price. I bought twin comforters. The shams and comforters look great on the beds. I'm happy with the purchase. Great Comforter Set! We we purchased two of these comforter sets. Comforters are difficult for me to find, especially one that is not frilly or is not in a bed-in-a-bag style. I really only want the comforter but the shams do look nice. This set is really soft, light and warm enough for my teenaged son who is always too warm, but I keep the heat low at night in winter so he needs something to keep him warm. The colors are our personal favorite, navy and hunter green, and is perfect for a boy, but fine for a girl who doesn't require pink. It arrived quickly and the price was right. Love it. Makes the room look very cozy. Love the pattern and the print of this ! Shipping was fast. Big enough and warm enough. I was worried about the size for a "king" size bed. Not to worry. Covers my wife, the two black labs, and I comfortably. Verry happy with my purchase and the overall quality of the comforter and cases. The comforter set arrived within a few days of ordering and looks just as it does in the picture. The color was awful.The one I recieved vs the advertised set was different. I returned it. Excellent Quality. Provides warmth, but weight not too heavy. Washes well directly in washing machine. Dries without shrinkage. Retains shape. Would definitely infidelity recommend product to friends and relatives. I love the comforter, it’s perfect for my teenage son, but the pillow shams didn’t come with it like it says. I don’t know if my order was just wrong or what but I can’t find shams to match the comforter. Soft, comforter with clean look. It is fantastic and the colors are just like the picture. I would definitely recommend buying it for a guest bedroom. Warm. Good weight. Great purchase! Very nice comforter! Happy with it! Needed to replace the older bunk room bedding for family cabin in the mountains. This product was made well and exactly what I had envisioned for the space. The set adds a preppy mountain look to the room. Good quality and washes well...which we need as we rent out our vacation home. The vibrant color on this comforter was a wonderful surprise. Both sides of this reversible gem will be used. It is light weight but still the down alternative keeps us very cozy. I would have expected to pay twice as much for a product of this quality. I am loving this comforter. It is so warm and cozy. It looked great with my Christmas decorations and still works for the rest of the winter. I had a flannel comforter when I was a teen and have looked for a long time for something I liked as well as that one. I am so glad I found this comforter, it is all I wanted and more. My power went out during a heavy snow storm, after dark, and I thought I would have to bundle up and add more blankets but I was quite comfortable in my pajama pants, short sleeve shirt, sheet, and this comforter. "Does it include the plillow shams"
"Are there sheets that go with this set?" No sheets come with this set. No,just the comforter and the sham . However the comforter is very warm even though it is very lightweight . "I want to order for my daughter's birthday in January and wondering how many cal-kings you have in stock. I am out of the country at the moment or I would order and have it shipped to me, but want to wait until after Christmas to order. Please advise. Thank you." Hello gurney27, the current in-stock availability is listed from the quantity drop down box. Please let us know if you have additional questions. Thanks for shopping with us. "Can I buy just two pillow shams to go with King set?" Hello Linny46, we do apologize, the shams are not currently sold separately. Thank you for shopping with us. "How much does the twin/twin xl comforter weigh?" Hello Hannah, we only have the shipping weight which is 4 lbs. Thank you for shopping with us. Hello Carol, yes this is reversible. Have a great day! It is for my father and he loves this kind of look.